I’m not a huge fan of the Minnesota Twins. I really respect them, but I dislike them. What’s worse than watching them walk-off in victory when your team is three outs from moving back within two games of first place? Watching a former White Sox hero (Jim Thome) whom we let go to Minnesota for nothing do the damage. But I look forward to teaching Liam all about the lessons of life in sport. And just think, it was less than two years ago when Thome hit a blast for the Sox to lift them over the Twins in the tiebreaker game and into the playoffs. My sister and I were there. Second best Sox game I’ve ever attended–maybe the most intense. One lesson I need to learn: Cease cursing at TV. I will predict a bench clearing fight or an absolute Ozzie tirade in the next 48 hours. We’ll see if this season is simply Black & White over the next week or so. Otherwise, we’ll be witnessing a Twins team without their closer and homer leader atop the AL Central again. How does a 10-week-old get toe jam? Weird, but Liam is compiling lots of fuzz between the toes. I was shocked to see one parent was actually concerned about this on one Web site. I am not concerned, for the record. 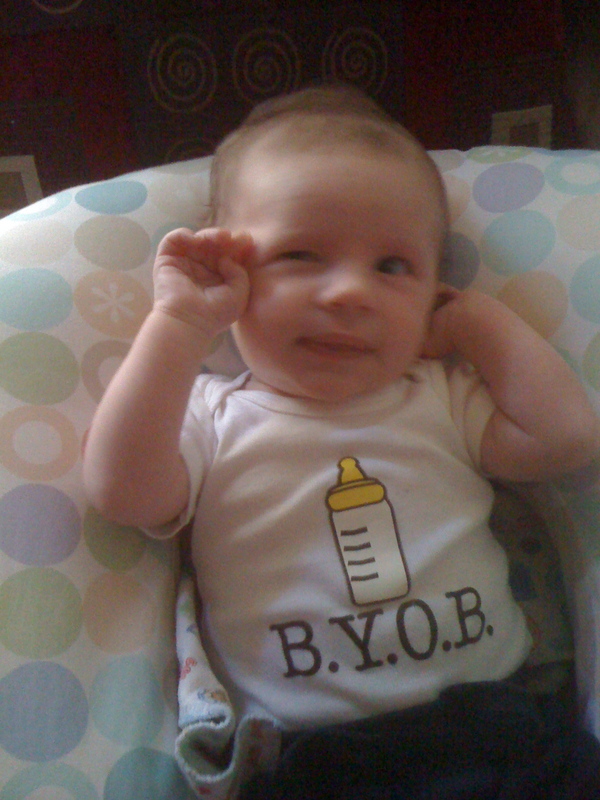 BYOB for Liam and his toe jam. Smitty creation on the shirt. About 30 days ago I was concerned about the White Sox. Not so these days as the Good Guys take an eight-game winning streak into the All-Star break along with the AL Central lead. Not bad for a group nine games under .500 a month ago. Will Liam get to see postseason baseball in his first year on earth? For a Chicagoan, that would be pretty good. #39: Happy Anniversary to my parents. Yesterday would have marked 39 years of marriage. I can imagine my Dad upstairs trying to find a weird gift for my Mom. I don’t think gifts were ever his thing. Just keep providing sunshine, Dad. Oh, and Sox victories. And a full college scholarship for Liam. That’s it for now. NEW PHOTOS: Check the SulliAlbum to the right for updated photography. Apparently SulliMom has been hearing complaints. Sooo sorry. RIP: We’ve lost one of the great public address voices of all-time: Bob Sheppard. One of the thrills of visiting old Yankee Stadium was hearing Sheppard on the call. Specifically his introduction of the Yankee captain. Now batting, the shortstop, #2, Derek Jeter (jee-tah)…#2. Read more about his life here. Hopefully the Sox and Yanks will tangle in the ALCS this year. When I was a bachelor I would get home from work, go for a run, make some mac n’ cheese, watch a little Chicago Tonight on WTTW (pre-cable days for me) and hunker down to watch some White Sox baseball…on the internet because I didn’t have cable. Silliness. Tonight, I came home from work and enjoyed a lovely beef stew dinner from the slow cooker, hung out with the family and tried on the BabyBjorn for size. Sadly, Liam was a little sour so we didn’t get a chance to step into public. I’m not complaining about the difference in lifestyle, I just think it’s funny to go from no cable to BabyBjorn. But I can’t lie. I tried it on and adjusted the size. I looked at myself in the mirror and took a couple of laps around the condo. No shock here, I looked great. I mean, I’ve always envisioned myself looking like the model on each BabyBjorn package with flowing locks and chiseled features. Despite Liam feverishly crying, it is a comfortable fit. I look forward to the public debut of SulliBjorn. God bless Sweden for providing the fertile ground to create such a device. More reviews and photos, then. Does anyone use the BabyBjorn? Like it? Perhaps, a different yet similar device? Just like M.J. when he rocked the 45 and tallied the double-nickel at MSG, I’m back. After more than a week of blogging hiatus, SulliDad returns to the scene. Okay, enough third person. Truthfully, I had a lot to say last Sunday. It was my first Father’s Day as a Dad and my first without my own Dad. But a very busy day of traveling, running, visiting, traveling, eating and visiting some more…followed by an evening of packing for a trip delayed me. But the morning started bright and early with me opening cards. The card from SulliMom had tickets to see The Script, a new favorite of mine. I guess I should take my wife since there were two tickets. I’m pretty excited to see this group from Ireland play live. It was an emotional, warm and humid day. I tried not to show it, but I’m sure people could read the emotions on my face at times. The first moment came around the two-mile mark of the 15th Annual Kilbride Family Classic 5k in Kankakee, which raises money for autism research. Each year, my Dad would be stationed at the two-mile mark reading off times. He would use the Timex watch I purchased him for a Father’s Day gift years ago, but I always had to set it for him to “chrono mode”. This year, as a member of Sully’s Striders team, I ran past the two-mile mark and he wasn’t there. It’s not like I knew he wouldn’t be there, but it still choked me up a bit. The happy trio after the race sporting Sully's Striders T-Shirts and onesie. But as I neared the finish line and saw SulliMom holding up Liam as he pseudo-cheered, I could feel my Dad at that moment. I think the reason for that–my slow time. 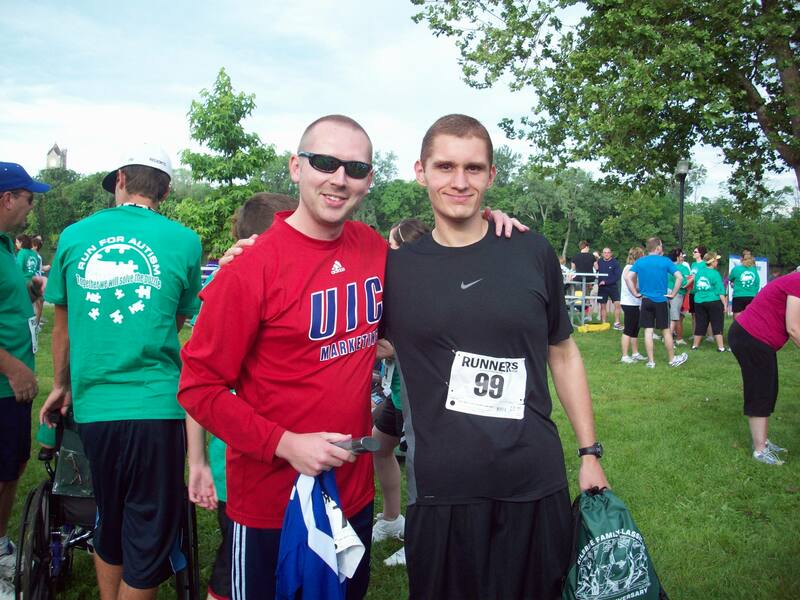 At a race where I’ve run near 16:00 I had turned in a pedestrian 20:50. I could hear him yelling, with a cigarette between his fingers, “Go, get going. Don’t waste it.” He really would have given me hell for being defeated by my high school distance coach, Ken Klipp. He still has it. It was a fun race with tons of family around. In addition, the suddenly speedy John Jaramillo drove all the way to K3 to support us and continue his alarming running progress. He turned in a PR by about two minutes. When my Dad was awarded the race volunteer of the year award posthumously, Molly, Liam, my Mom and sister hopped on the stage. Mark Kilbride said several kind words about my Dad and provided my Mom a plaque and gift in front of about 1,000 folks in steamy Cobb Park. Never one to shy away from a microphone, I was given the opportunity to say a few words of thanks. One last time, thanks to the Kilbride Family. After the race en route to a gathering of Molly’s side of the family, we stopped to visit my Dad at the cemetery. As I held Liam over the spot where my Dad was buried less than a year ago, I kind of lost it. 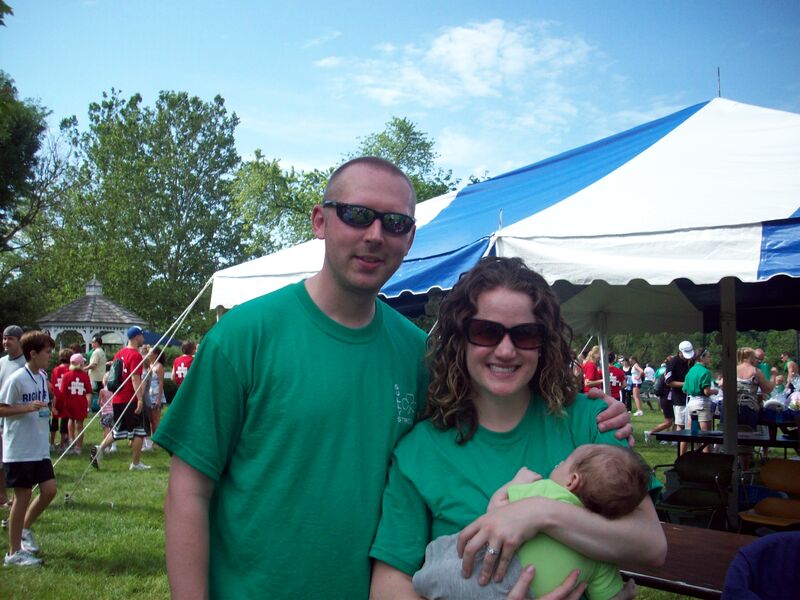 It felt good to let it go and it also felt great to have Liam and Molly by my side. Liam’s innocence provided perspective and our day continued. I look forward to telling stories to Liam about my Dad each Father’s Day. Although overshadowed a bit on this Father’s Day is me gaining a Dad for the first time officially since the nuptials–a Father-in-Law. Molly’s Dad is great. I’ll stop there so my sister-in-law Emily doesn’t suspect me of brown-nosing so just trust me–I’m lucky to have gained a Dad, too. The rest of the week, I’ll tell in photos…by the way, how about those White Sox? I was at a conference in California most of the week. 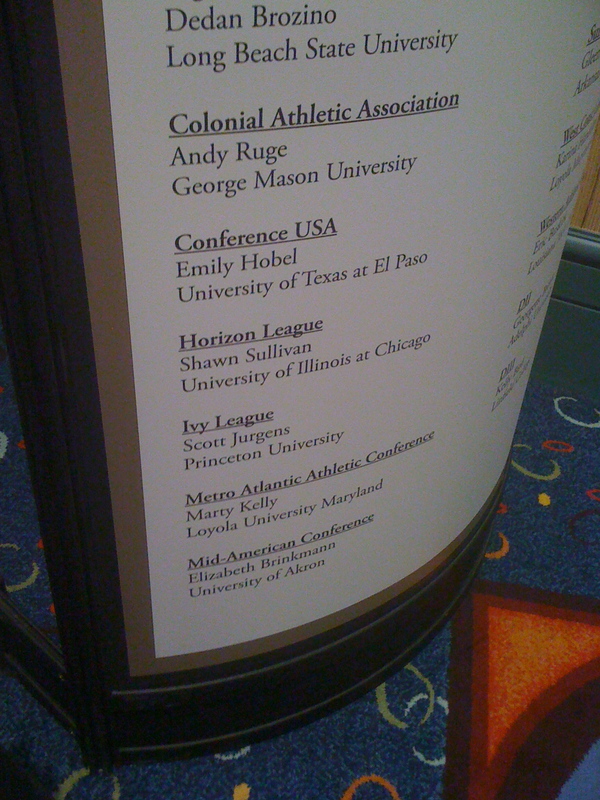 I am the rep for the Horizon League. This proves it. I win things all the time. I won this at a session presented by the good folks at Broadnet. 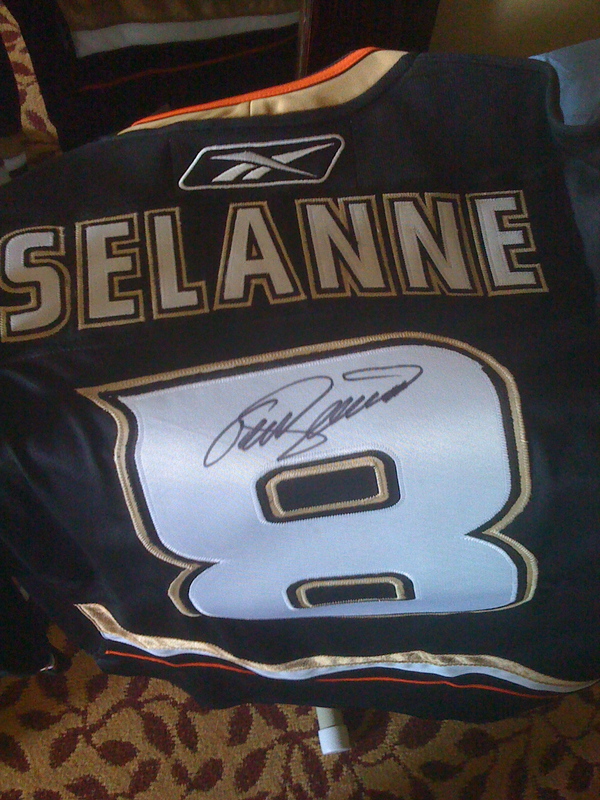 Autographed Ducks jersey by Teemu Selanne. 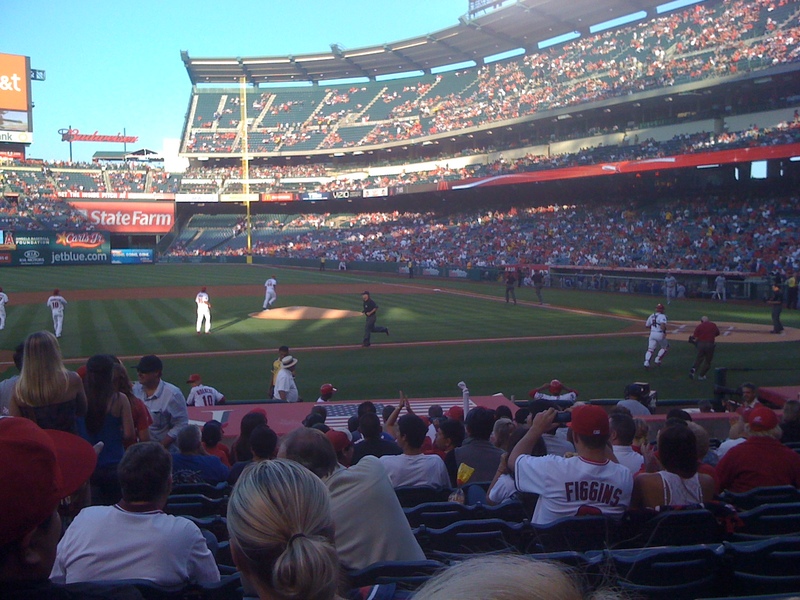 Great seats for Angels-Dodgers in Anaheim Wednesday courtesy of old pal, Ben Fischer. 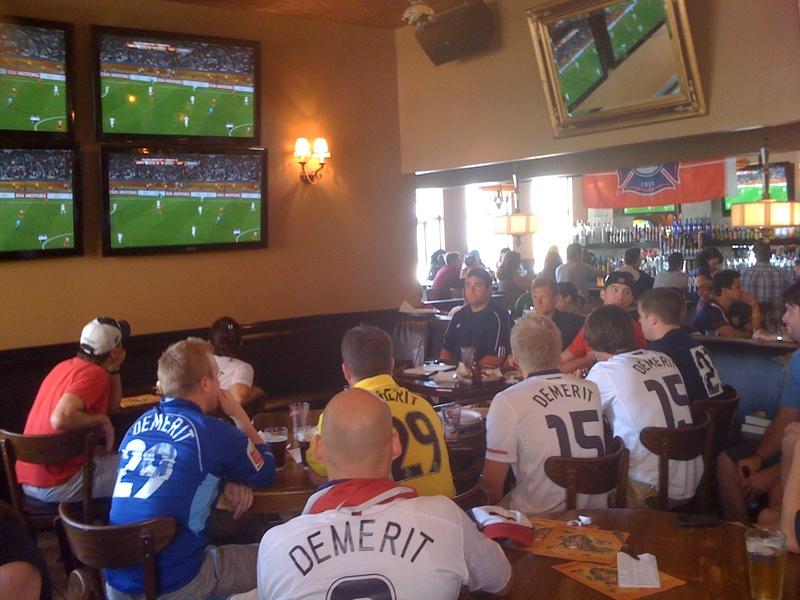 Union Park World Cup Watch Party hosted by the Flames...lots of DeMerit jerseys. 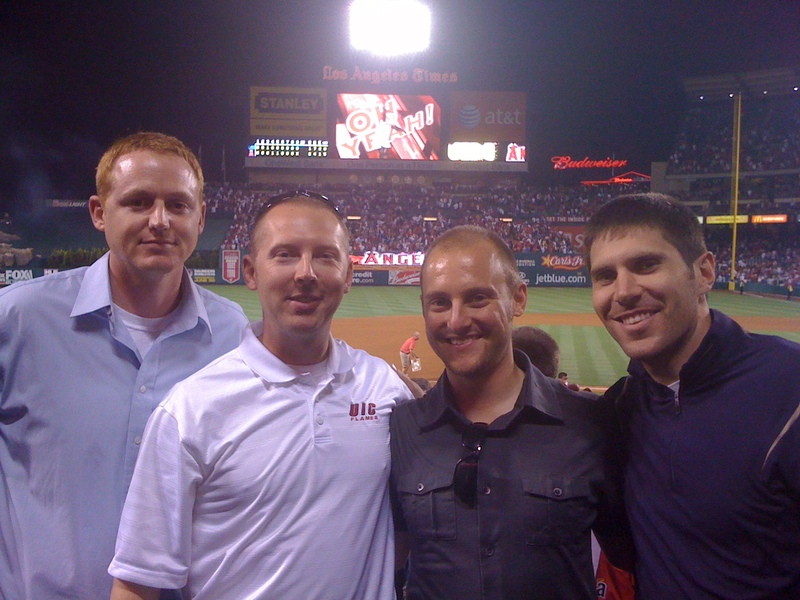 L-R, Ticket donor, Ben, SulliDad, and two guys I'm looking forward to working with a lot this year, Reno and Jon...live from Angels Stadium. The cost of raising Liam from birth until he is 17 is more than $222,000, according to a recent report. That doesn’t include college savings. Crap. I mean, I would have been a little more careful in Ireland if this report from U.S. Department of Agriculture came out last year. Which begs the question, Why is the department of agriculture doing a study like this? Read the story and start clipping the coupons. U.S. Rally Foiled By Malian Referee: We hosted a really great World Cup Watch Party at Union Park Lounge this morning to see the U.S. and Slovenia finish level at 2 apiece. UIC guy Jay DeMerit once again represented well for the good guys. It was a lot of fun. Not fun was the brutal call by the referee. Mistakes are made, but FIFA needs to clean up the debacle that is international officiating. I’m not a homer; it happened to Germany today, too. Okay, I’m a mini-homer. THIS JUST IN: Yahoo! is reporting that FIFA will provide an expedited performance review. Way to go FIFA. White Sox Beat Strasburg: Okay, Sox hurler Gavin Floyd allowed his squad to get the win over the Nationals and Stephen Strasburg. He went toe to toe with the phenom and the south siders are suddenly rolling. I love playing the NL. Here are a couple of great stories/links that will get you thinking. Speaking of thinking, I think what I want to make sure I do as a Dad is to take time out to think once in a while. Constantly, I’m told I won’t have any extra time once SulliBaby arrives. I get that, but I want to make an effort to take a moment each day and simply think. The Southsiders aren’t exactly tearing the cover off the ball in 2010, but one story that will make you feel good is that of Sergio Santos. Read this feature from the NY Times. We all have things we wish we would have said at some point. Here’s a remedy for that: The Things Unsaid Project. I can tell you I will be writing a letter. Why? Because whether it’s a regret, a missed opportunity or simply forgetting to say it, ‘it’ needs to be said. Plus, letter writing is a lost art. Make it a point to write a letter a month for the remainder of 2010. I bet you feel better and you’ll make someone’s day. I’m giving it a whirl. I came across this WordPress blog by accident. I’m glad I did because it made a lot of sense to someone like me who, no matter what, will be a Dad by Friday night. I’ve had many questions filter in from across the country. Many of which have been awesome in nature. I’d like to take a moment and answer those this evening while watching the Blackhawks. Come on guys, Nashville? It’s worse than losing to Cleveland. But the Sox won tonight. Thankfully we very well might have the best pitching staff in the AL. Answer: No, we are awaiting a surprise. But I think it’s a boy. Thanks Art! Answer: We have a few top choices, but think Irish and plain. Answer: Neither. SulliMom will take care of that. Answer: I’ve been sleeping fine. However, I’ve looked into it–you can’t bank good sleep now in order to use it once a newborn starts keeping you up at night. It’s science. Answer: Thanks for noticing, Herb. It comes down to two things: drinking water and running 12 minutes per day. Oh, and generic vitamins from Target. Answer: It is a natural curl, Regina. However, she does nurture the curl with a couple of products that we found at the Maxwell Street Market.